The Brisbane property market turned the corner last year with home buyers and investors returning to the market. 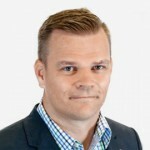 Research by Onthehouse.com.au has revealed that Queensland is the sixth wealthiest state when it comes to residential property, with 3.3% of dwellings in the metropolitan area valued at over $1 million. While the most expensive street can be found in Bumimba, the suburb itself ranked seventh on the top list of suburbs with 44.11% of houses in the millionaire’s club. New Farm ranked first on the scale with a rate of 72.87%, followed by Teneriffe (67.01%), Chandler (66.83%) and Ascot (61.80%). Calculated on a percentage basis (houses valued over $1 million), the table below demonstrates the wealthiest QLD suburbs in ranking order. 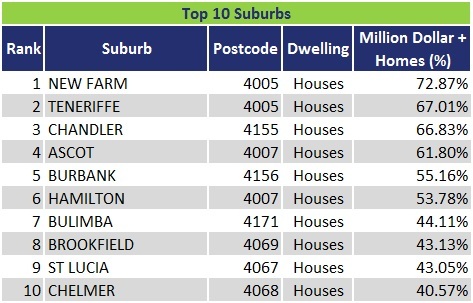 “Based on our findings, we expect to see new suburbs emerge as millionaire property hotspots over the coming year. The most property-rich street in Queensland was Waterline Crescent in Bulimba being the number one destination for million-dollar houses according to Onthehouse.com.au. 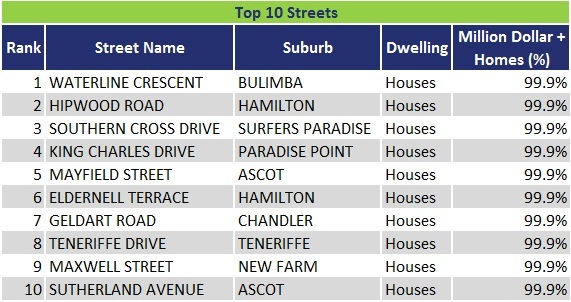 Calculated on a percentage basis (houses valued over $1 million), the table below shows where the wealthiest streets in metropolitan QLD can be found. “With Australian values at a high, many more properties are breaking through into the exclusive ‘millionaire’s club’. The fact is, many Australians are unaware of their property’s current value and their new status as ‘property millionaire’. You can read about Melbourne’s Million Dollar Suburbs here and if you’re interested in learning about Sydney’s million dollar suburbs then keep an eye out for George Raptis’ blog tomorrow.